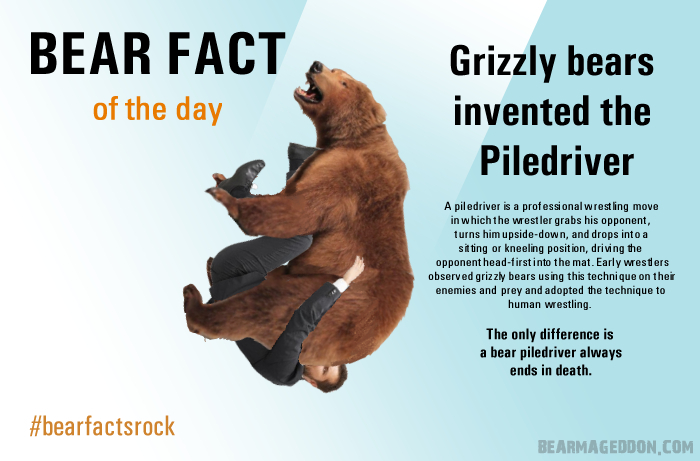 Here’s your bear fun fact for the day. I bet you always wondered! Now I have something else amazing to share with you. In order to plan out these scenes, I had Josh Slone and his wife, as well as Dan Manson, all former employees and managers of Wal Mart, consult with me about what a store like Wow Mart might sell, have available, and what the limitations might be. They answered a bunch of my questions about Wal Mart and how you might survive a situation like this. Here is just a sample of what Josh sent me after he and his wife wrote up for me. It’s super detail oriented and awesome. Securing Entry/Exit: The building is made of brick and the fire exits are heavy metal. The weakest points are the garage doors in the backroom receiving area and, of course, the entrance(s). Entrances: Use a forklift/pallet stacker to push useless material into the entryway. Things like register setups, shelving, heavy stuff that can’t benefit anything else. Next, take the heavy steel warehouse shelving from the backroom and create a durable “cage” behind the first barrier. Garage Doors: These doors are pretty weak compared to a bear, but one or two (out of three) are usually covered by a semi-trailer and wouldn’t be a problem (although you could fill the trailer or use it for a holding cell for unruly survivors). Also the same warehouse shelving tactic in front of the garage doors. Fire Exits: Even though bears probably won’t enter here panicked survivors may try to get out. Removing the push bars and putting chains on all fire exits that aren’t planned escape roots should keep them from going outside. Roof Access: In almost every Walmart there is only a single roof hatch at the top of a permanent metal ladder in the backroom. It would make a great place to lookout and potentially kill bears until the other door security is in place (not sure at what point your characters will be entering). There are so many different types of food, but in order to make it last as long as possible it has to be consumed in the correct order. All rationed food couldn’t be locked easily (since there is so much of it), but you could move it all into a section of the back room and have it guarded. Refrigerated: Everyone is in short sleeves in your comic, which means storing frozen/fridge food in the attached trailers (mentioned above) won’t work like it would if it’s winter or cold climates. The first thing that should be consumed are the refrigerated foods. Fresh meat, dairy, eggs, etc. Depending on the number of people you would most likely feed as many as much as you could since it will likely spoil before you use it all. Freezer: While this still won’t last long, you could probably get away with starting with this food on the 3 rd or 4th day if the door to the main freezer is kept shut and ice from the ice chests was put in there immediately. Things in this category are TV dinners, frozen meat, pizza rolls, etc. Although, once you open it, you have to eat it the same day. Fresh Foods: Veggies, fruits, breads, doughnuts. They would be stale, but edible and should be consumed before unnecessary waste. Dry Groceries: Now it’s a matter of rationing and using the food that expires soonest first. Calculating rations while you’re eating the food you don’t have to ration makes the most sense. 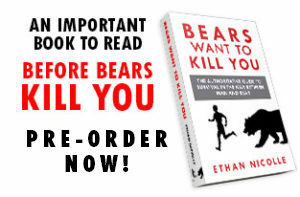 There are a few long term options like freeze dried food in sporting goods, but not enough for a decent sized colony of bear survivors. Catching More: Worse case scenario time wise, bird food from lawn and garden and traps could be used to catch birds on the roof. Cooking: There are two things to cook with: propane stoves and propane, grills and charcoal. While most Walmarts have a decent supply of both, the smoke created would be troublesome. You would have to open up a skylight (in most Walmarts) to allow the heat to rise out of the building without filling it. Eating: (except for the first week) would have to take place at certain scheduled times. Tables and chairs are in ample supply and should be put in a common well lit area. Before the meal, any necessary information would be conveyed. Sleeping: There are several bedding options in most stores, but not usually mattresses. There are mattress pads, cots, sleeping bags, pillows, lots of blankets/comforters. There are no soft surfaces only concrete so this would be tough, but there are usually 50-100 sleeping bags in a Walmart at any given time. Location would be close to a designated escape route, and potentially split between two depending on the size of the group. should be easy to identify the most useful ones. It would make sense that treatments would happen in the pharmacy or vision center which are already set up with equipment and space. A Note On Weaponry: Walmarts only carry rifles and shotguns, but are usually in short supply of all types of ammo. It’s safe to assume that most of the effective rounds against bears would be used up during the initial setup of the store. 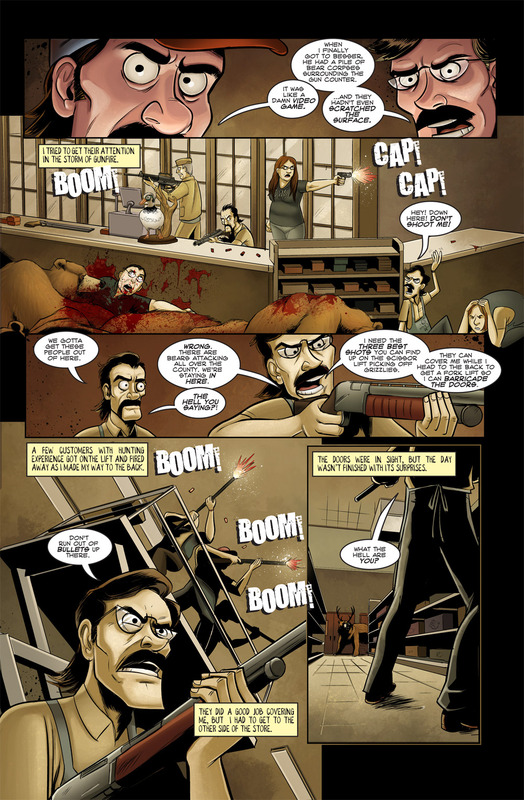 Other weapons could be fashioned, but poisoned food could be thrown from the roof and you could fashion some more of those propane torches like in your comic. This was just the first pass. I sent them a bunch more questions. I only used bits here and there, but it’s been super helpful in writing these scenes. Granted I did put some hand guns for sale in WOW mart, but it’s not the exact same store. If you ordered a commission and/or book, they are going out TODAY! Comic Con got in the way, I needed some copies for the event so I had to order some more to fulfill my orders. Sorry for the delay. I’m excited for you guys to see what I drew in your books. Thanks so much for your patience on that. What about the flying bear squirrel, the octo bear and the bear mole? Awesome. I love all the realistic details–perfect for fiction and / or RPGs and such! It just got REAL up in here! Great page! Lots of action! One of the things I love about this comic is how practical a lot of the decisions are that the survivors make: they come across as real people, making realistic decisions. A typo FYI, for when you get this printed: looks like “they can cover my while I head to the back” should be “cover me” or “cover my back” instead? “They can cover my while I head to the back” just a small little typo error in the middle. Just in case you didn’t notice it yet. Also, woot! More mutants! I love the mutant bears and I can’t wait for Octobear to make a living appearance, seeing as we have only seen him dead so far.